Autism Society of Greater New Orleans – Improving the lives of all affected by autism. Sign up to receive the latest information and resources through our e-newsletter. Start a conversation today. Simply by talking about autism and the important steps people can take to help will show support for individuals and families living with autism. Use your voice. Take action and stand up for individuals and families living with autism. Learn about the issues impacting individuals and families living with autism. Contact our Autism Helpline by calling us at 504-464-5733 OR by emailing us at info@asgno.org. We are here to help you find resources and services in our local area, provide information and education, and offer support to all in the Greater New Orleans area who are living with Autism. Donate. Support the work we do. Your support enables us to run our Information and Referral Program, our Annual Mini-Grant Program, and to continue to expand the services that we provide in the GNO area. Volunteer [link to opportunities where people may volunteer their time]. Working together, we can show the world how great different can be. Local Company 1-800-Repairs has generously agreed to partner with us here at ASGNO! They will be donating a portion of their revenue directly to us to help support our programs and help us help the local community even more! Their generous support will allow us to continue to run our highly popular Information and Referral program, our Mini-Grant Program, and to help us expand our available programming to continue our mission to improve the lives of all affected by Autism! And remember, all funds donated to ASGNO stay in the Greater New Orleans area, so they are giving back directly to the local community. Their generosity is inspiring and we truly appreciate our partnership! Read below to find out more about 1-800-Repairs and check out their website! “At 1800 Repairs Network, we are a repairs and remodeling facilitation service for home, boat, and auto repairs that works residentially and with property managers and owners to make life just a little easier. We have a rolodex of service providers around the state of Louisiana here to make life easier. IA lot of people have “a guy” for when something breaks. But somehow, some way, there always seems to be something that breaks at the most inconvenient time that you just don’t have “a guy” for. Instead of googling to try to figure out who to call, who will get you the best deal, who is legit, and who can get it done the fastest, just call the easiest to remember number in the industry, 1 800 REPAIRS. You call, we collect the information, and take care of everything else and facilitate the entire repair. Family Game Night in New Orleans and Slidell! The Autism Society of Greater New Orleans is excited to announce two Family Game Night locations; one in Slidell and another in New Orleans! Family Game Night is an opportunity for children on the spectrum and their siblings to not only have fun but to learn while they are having fun. It is also an opportunity for parents to mingle and network with other parents. There will be an assortment of games with varying levels of physical activity, e.g., board games, interactive games, scavenger hunts, one-on-one, two-person or multi-player games. And there will be a variety of volunteers playing the games along with the children to assist with game instructions, rules, and modeling how to play the games appropriately. Come join us for some friendly family competition and some good ole fun! More information is available on our Family Game Night page. 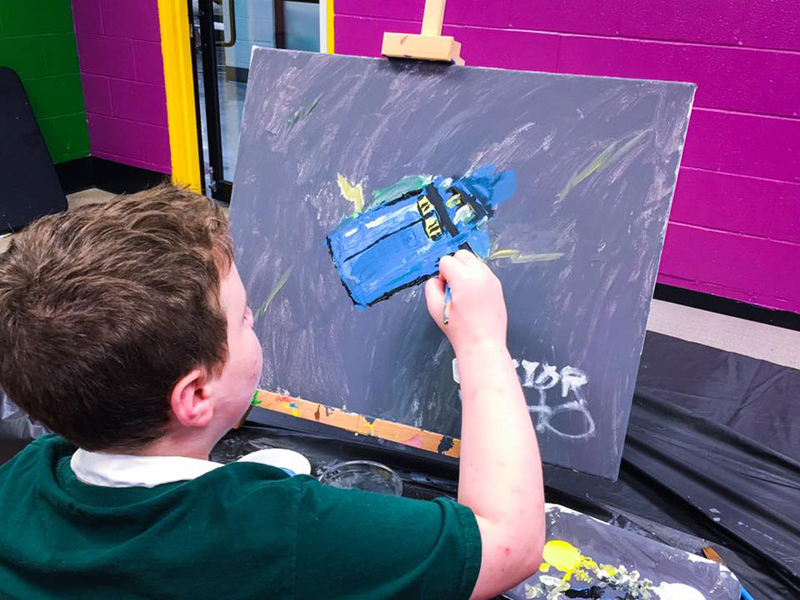 The Autism Society of Greater New Orleans is pleased to announce three locations for our Brushes, Buddies, and Beyond program. One in Chalmette, one in Metairie, and one now in Belle Chasse! Our Chalmette sessions, in collaboration with JBJ Creations, are held at Covenant United Methodist Church, 115 East D’Amour St. The Metairie sessions are in collaboration with and held at the East Jefferson YMCA, 6691 Riverside Drive. And the Belle Chasse sessions are held at the Belle Chasse YMCA, 8101 Highway 23, Belle Chasse, LA 70037. Read more on our Brushes, Buddies, and Beyond for Autism page! Do you shop on Amazon.com? If so, Amazon will donate 0.5% of the price of all eligible AmazonSmile purchases to the Autism Society of Greater New Orleans when you shop at AmazonSmile. Just go to smile.amazon.com or click the banner below and simply log into your Amazon account. Then shop AND support the Autism Society of Greater New Orleans at the same time! About Amazon Smile. AmazonSmile is a website operated by Amazon that lets customers enjoy the same wide selection of products, low prices, and convenient shopping features as on Amazon.com. The difference is that when customers shop on AmazonSmile (smile.amazon.com), the AmazonSmile Foundation will donate 0.5% of the price of eligible purchases to the charitable organizations selected by customers. Use Discount Code ND-095 when booking a cruise with Autism on the Seas (AotS) and they will make a donation on your behalf to the Autism Society of Greater New Orleans (ASGNO)! And each family that uses the Donation Code will receive a $25 Onboard Credit for use during their cruise! Book a 5 night (or longer) cruise and AotS will donate $100 to ASGNO. Book a 2-4 night cruise and AotS will donate $50 to ASGNO. All you have to do is use Discount Code ND-095 when booking your cruise. Donations will apply only to guests who have not cruised with Autism on the Seas in the past. Visit their website at www.AutismOnTheSeas.com for pricing, availability, and additional information.